On this page I put together a collection of pulley problems to help you understand pulley systems better. The required equations and background reading to solve these problems are given on the friction page, the equilibrium page, and Newton's second law page. 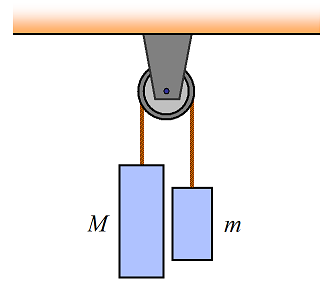 Two blocks of mass m and M are hanging off a single pulley, as shown. Determine the acceleration of the blocks. Ignore the mass of the pulley. 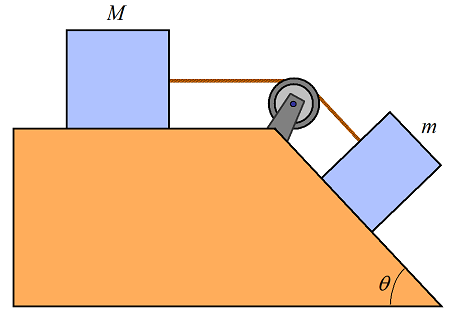 Two blocks of mass m and M are connected via pulley with a configuration as shown. The coefficient of static friction is μs, between block and surface. What is the minimum and maximum mass M so that no sliding occurs? 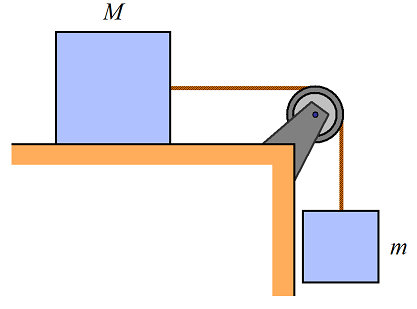 Two blocks of mass m and M are connected via pulley with a configuration as shown. The coefficient of static friction between the left block and the surface is μs1, and the coefficient of static friction between the right block and the surface is μs2. Formulate a mathematical inequality for the condition that no sliding occurs. There may be more than one inequality. 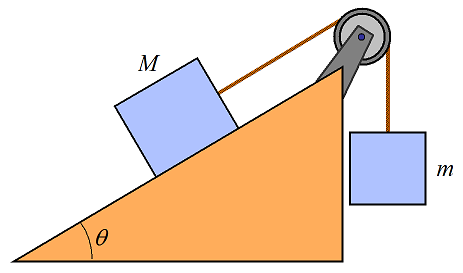 A block of mass m is pulled, via two pulleys as shown, at constant velocity along a surface inclined at angle θ. The coefficient of kinetic friction is μk, between block and surface. Determine the pulling force F. Ignore the mass of the pulleys. 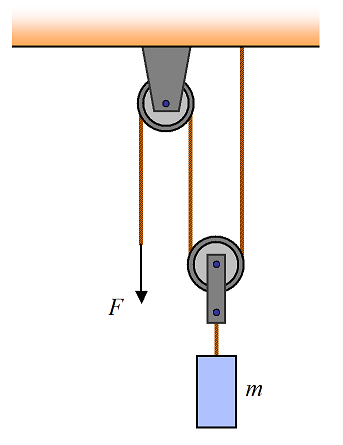 A block of mass m is lifted at constant velocity, via two pulleys as shown. Determine the pulling force F. Ignore the mass of the pulleys. 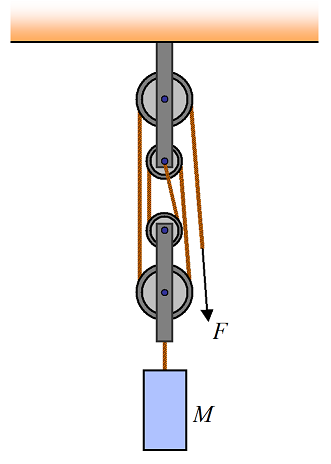 A block of mass M is lifted at constant velocity, via an arrangement of pulleys as shown. Determine the pulling force F. Ignore the mass of the pulleys. The hints and answers for these pulley problems will be given next. This is called the Atwood machine and is commonly used for demonstration in physics classes. Apply Newton's second law to the block on the left. We have Mg−T = Ma (taking the downward direction as positive). Apply Newton's second law to the block on the right. We have mg−T = -ma (the acceleration of the two blocks have opposite signs, since one moves up and the other moves down). Combine these two equations and we can find an expression for the acceleration of the blocks. For the maximum mass M, the block is on the verge of sliding down the incline. This means that Mgsinθ−T−Mgcosθμs = 0, where T is the tension in the rope. Since T = mg, we can calculate the maximum M from the previous equation. For the minimum mass M, the block is on the verge of sliding up the incline. This means that Mgsinθ−T+Mgcosθμs = 0, where T = mg. We can calculate the minimum M from the previous equation. This is a challenging problem! It took me a while to figure this one out! At some angle θ1 > θmax1 block M will slide down on its own if there is no rope attached. Similarly, at some angle θ2 > θmax2 block m will slide down on its own if there is no rope attached. It is known that θmax1 = atan(μs1) and θmax2 = atan(μs2). If θ1 ≤ θmax1 and θ2 ≤ θmax2 then no sliding occurs. There are three more cases to consider. θ1 > θmax1 and θ2 ≤ θmax2. Apply the equilibrium equation to block M in which it is on the brink of sliding down. We have: Mgsinθ1−Mgcosθ1μs1−Tmin1 = 0, where Tmin1 corresponds to the minimum rope tension preventing block M from sliding down. 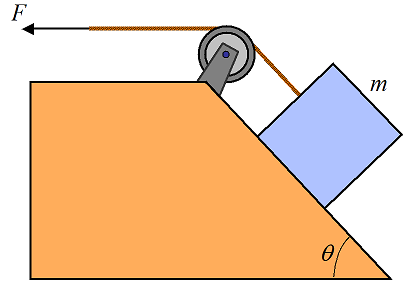 (Note that the system naturally "settles" such that the rope tension T required to stop the block from sliding down is the minimum possible amount). For T < Tmin1 the block slides down. From this equation we get Tmin1 = Mgsinθ1−Mgcosθ1μs1. Call this equation (1). There is no need to consider block M sliding up since it is an impossibility for θ2 ≤ θmax2 (which means block m cannot slide down which means it cannot pull block M up). Tmin1 must be provided by the block m and must not exceed the maximum rope tension which can be resisted by block m and not be pulled up the incline. This maximum rope tension can be determined from the following equilibrium equation applied to block m: mgsinθ2+mgcosθ2μs2−Tmax2 = 0, from which Tmax2 = mgsinθ2+mgcosθ2μs2. Call this equation (2). θ1 ≤ θmax1 and θ2 > θmax2. θ1 > θmax1 and θ2 > θmax2. For block M, Fnet1 = Mgsinθ1−Mgcosθ1μs1. And Fnet1 > 0 since θ1 > θmax1. For block m, Fnet2 = mgsinθ2−mgcosθ2μs2. And Fnet2 > 0 since θ2 > θmax2. We now have three sub-cases to consider. The final inequalities for this case will be given within these three sub-cases, as follows. If Fnet1 = Fnet2 the blocks will not slide. If Fnet1 > Fnet2, then Fnet1 ≤ mgsinθ2+mgcosθ2μs2 for no sliding. 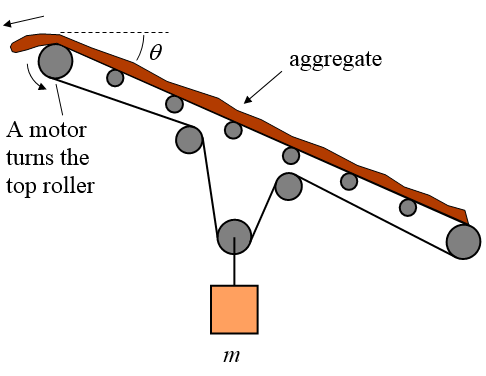 Note that Fnet1 is equal to the rope tension, and this rope tension is the minimum required to prevent block M from sliding down the incline. If Fnet2 > Fnet1, then Fnet2 ≤ Mgsinθ1+Mgcosθ1μs1 for no sliding. 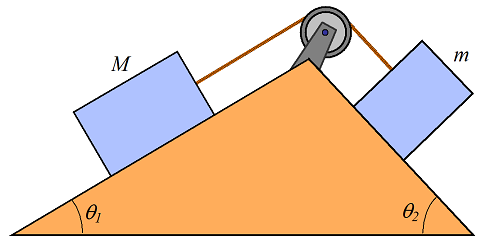 Note that Fnet2 is equal to the rope tension, and this rope tension is the minimum required to prevent block m from sliding down the incline. Apply the condition of static equilibrium to the block. We have 2F−mgsinθ−mgcosθμk = 0. The term 2F comes from a force analysis in which we see that there are two segments of rope pulling equally on the block. We then solve this equation for F.
Apply the condition of static equilibrium to the block. We have 2F−mg = 0. The term 2F comes from a force analysis in which we see that there are two segments of rope pulling equally on the block. We then solve this equation for F.
Upon close inspection we see that the bottom two pulleys are held up by four segments of rope. The tension in the rope is assumed equal throughout its length (a good assumption for ropes in general since they weigh little). Three of the four rope segments are vertical while the remaining rope segment is at a small angle with the vertical. But for ease of calculation we can treat it as being exactly vertical. Since we are ignoring the mass of the pulleys, the tension in the four rope segments must equal the weight of the mass, in order to satisfy the condition of static equilibrium. Hence, 4F−Mg = 0. We then solve this equation for F.
A conveyor belt carrying aggregate is illustrated in the figure below. 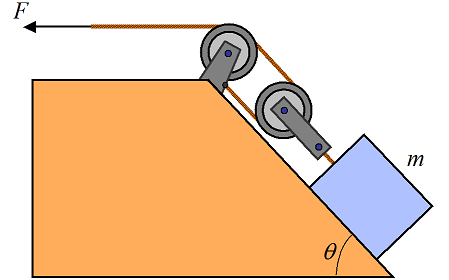 A motor turns the top roller at a constant speed, and the remaining rollers are allowed to spin freely. The belt is inclined at an angle θ. To keep the belt in tension a weight of mass m is suspended from the belt, as shown. Find the point of maximum tension in the belt. You don’t have to calculate it, just find the location and give a reason for it.